LUNAR ABYSS, MIRA DREVO, MOSS RECONSTRUCTION, CREATION VI, UHUSHUHU, MYKORIZA, W I I, 73! Experimental / Drone. A collaboration of two Russian experimentalists: Igor Potsukailo (Bardoseneticcube) from St. Petersburg and Vitaly Maklakov (Kromeshna) from Kamensk-Uralskiy. Synthesizer rumbles and mild industrial noises, field recordings, mouth harp, radio transmissions, fragments of TV-news and other odd samples and mixed with the auto-training voice recordings, forming well-structured eventful collages soaked in lingering drones. Post-Rock / Experimental Jazz. A project from St. Petersburg, Russia, founded by Pavel Mikheev – multi-instrumentalist playing in numerous rock and experimental bands. In this incarnation Eject manifested as a trio with Pavel on guitar and effects, Dmitry Bibikov on double-bass and Konstantin Gubenko on drums and percussion. Six instrumental pieces somewhere at a meeting point of post-rock and experimental jazz. Dynamics with an unpredictable plot, emotionally charged atmosphere, sensitive and refined playing technique of all three musicians – recommended to the connoisseurs of unusual instrumental music! Muslimgauze "Untitled" (2000) - this "nameless" creation was published by Klanggalerie publishing house, and in a strange way sends the listener back to 1993, to the albums "Betrayal" and "Veiled Sisters", being their obvious and natural continuation. Slow and soft, like a lump of hashish, either a dub or a lounge with an intoxicating sultry sound it immerses the listener in a light trance... it gives you a feeling as if you are lying down for an afternoon nap somewhere on the outskirts of the Palestinian bazaar, and you have no strength to move to shake off this obsessive stupor. Someone is a chatting nearby, something is tapping, somewhere in the vicinity there is an incomprehensible life and households... but to get up - there is no strength. Not even to open your eyes... because bliss, heat and trance. Incredibly atmospheric and hypnotic hypostasis MUSLIMGAUZE. Definitely recommended. Standard edition in 4-panel digipak, limited to 300 copies. Muslimgauze "Untitled" (2000) - this "nameless" creation was published by Klanggalerie publishing house, and in a strange way sends the listener back to 1993, to the albums "Betrayal" and "Veiled Sisters", being their obvious and natural continuation. Slow and soft, like a lump of hashish, either a dub or a lounge with an intoxicating sultry sound it immerses the listener in a light trance... it gives you a feeling as if you are lying down for an afternoon nap somewhere on the outskirts of the Palestinian bazaar, and you have no strength to move to shake off this obsessive stupor. Someone is a chatting nearby, something is tapping, somewhere in the vicinity there is an incomprehensible life and households... but to get up - there is no strength. Not even to open your eyes... because bliss, heat and trance. Incredibly atmospheric and hypnotic hypostasis MUSLIMGAUZE. Definitely recommended. Collector's edition in 4-panel digipak made of designer cardboard with silk-screen printing, limited to 111 copies. French industrial project of Soldat Arnaud aka Nada-Negator, ex-ICK, chef of La Nouvelle Alliance label. "When old school industrial muzak meets minimal punk synth." Neofolk / Soviet. Soviet heroic songs performed in a renewed way by the people who most probably have been listening to England's esoteric underground at their time. The album is dedicated to "the Great Construstion of the White Sea – Baltic canal in the name of Joseph Vissarionovich Stalin, 1931-33". The program features the canal army song in Russian and Italian, a song about the austere Arctic, a song about Dzerzhinsky, and a psychedelic dream of the same canal army man. Great work with sound and arrangements, invigorating energy, sensitive balance of pathos and self-irony! Packed in a heavy glossy 4-panel digipak. Musique Concrète. Double-CD containing the works of the French electro-acoustic composer Alexandre Yterce from the period of 1988-2017. Glossy 6-panel digisleeve with a 24-page booklet containing images & stories behind each composition in French and English. Musique Concrète / Experimental. A compilation of the tracks by the composers of electro-acoustic and noise music, who took part in the annual contests named after Luigi Russolo in 2016 and 2017, and received the maximum votes from the jury: Julie Semoroz, Vincent Guiot, Lea Tania Lo Cicero, Simón Pérez, Nicolas Marty, James Andrew Babcock, Damián Lauraro Gorandi, Nathalie Mondor, Jan Kruml, Pablo Bas, Hideki Umezawa, Armando Balice, Oil Texture. 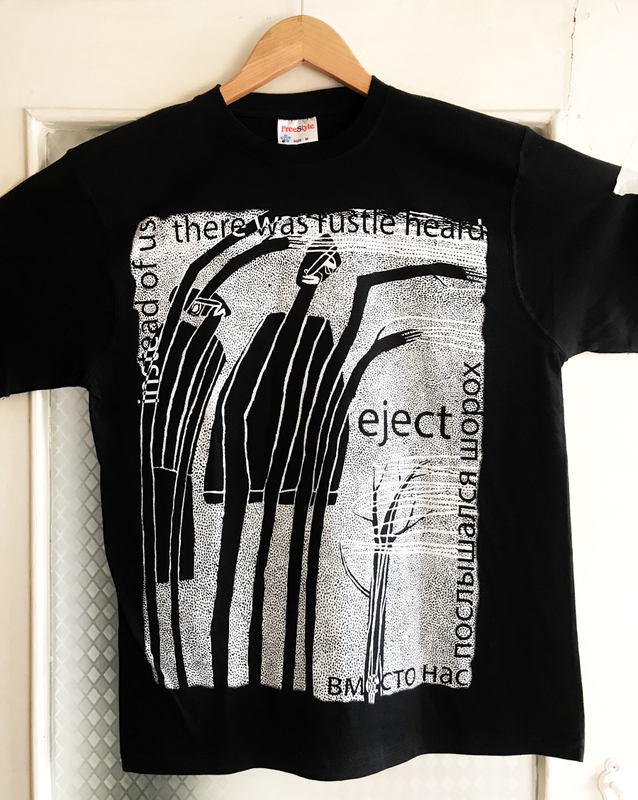 Black t-shirt from the EJECT project (St. Petersburg, Russia). The print is based on a cover of the CD "Instead of us there was rustle heard". Sizes M and L are available. Image. Whole discography of Spiral Vremeni - all 4 albums on CD-Rs in an original bag. Each bag is hand-sewn by the needlewoman Lyudmila Smolyakova according to samples of folk embroidery of Ostyak culture from the territory of the Tomsk region (Siberia, Russia). Whole discography of Spiral Vremeni - all 4 albums on CD-Rs in a wooden box hand-made by the master Pyotr Evtin. In addition to the four discs with original booklets, the box includes a clay handicraft on a magnet, with a Neolithic pattern made using authentic technology in the workshop of Tatyana Kalashnikova, a plastic flask with a sample of Siberian oil from one of the Tomsk region fields, postcards and cards with author's photos, a sticker.